Firefighters battle a previous blaze in Gangwon province. Although emergency responders stopped the massive fire’s spread quite quickly, people still pointed out room for improvement for the future. 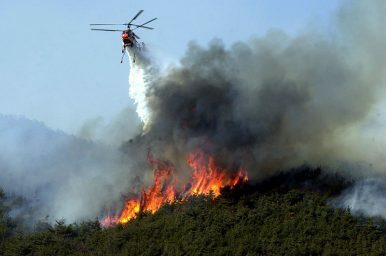 Because of the poor weather conditions, particularly high winds, South Korea’s fleet of firefighting helicopters was grounded for extended periods of time. And major broadcasters have drawn criticism for failing to provide sign language interpretation during emergency broadcasts about the blaze. Activists gathered this week for a rally and submitted a petition to South Korea’s National Human Rights Commission calling for required sign language translation for TV programs, particularly during emergencies. Others have pointed out the need to address some of the factors that may have exacerbated the problem before it even started, including droughts and other climate change-related issues.